Hey all, it's always interesting to get other Federer fan's perspectives on his matches and today a long time commenter of the blog, SidTheCookieThief, who I'm sure most of you will know put together a running commentary on the Federer vs. Tomic match. Tomic can't be blamed for mouthing off too much about it. The blame could be placed squarely on the scribes, who have a way of putting words into the mouths of players. Either ways, none of that matters. Roger isn't exactly amused with all of it anyways and it's time for Tomic to put the money where his mouth is, time to find out if he has learned anything at all from the schooling he received last time. First point and Roger shows he couldn't be more ready. A crisp approach and volley winner finally leads to an early break. The perfect start, for the perfect player. It seems as if Tomic is walking the walk. He makes some noise with a down the line backhand winner and gets the crowd excited. He follows it up with a great return and crisp volley. Federer aces to close the game. Roger 2-0. Tomic settles his nerves to get a fairly easy hold. Roger 2-1. A love hold for Roger makes it 3-1. Tomic looks a lot crisper and committed compared to their last meeting on Rod Laver. Gets a decent hold but Roger remains ahead at 3-2. In almost a stubborn way, Roger keeps going wide to Tomic, four times, in the deuce court. Tricky deuce game but is able to hold. Roger 4-2. Tomic has found his service rhythm. Two unreturned deliveries and an ace to get a love hold! Roger to server at 4-3. Roger squanders 40-0 but finds a first serve at the right time to get to advantage and holds to preserve the lead at 5-3. Tomic gets cheeky on game point and Roger gets to the drop shot well to stay in the game. He saves three break points to ensure Roger has to serve out the first set. Could Roger pay the price? A bit of trouble at 15-30 but Roger finds his first serve to close it out and bag the first set. Easy does it. 6-4, in 34 minutes. This is beginning to look like another routine match. Roger misses out on break points in Tomic's first two games but keeps holding with ease to level scores at 2-2. Then comes the point of the match so far. Tomic creates an angle on the Federer backhand and follows it in. Federer hits an unreal dipping cross court pass, to make it 30-0. The set is now 3-3. Federer gets to 30-0 on Tomic's serve. Follows it with a chip and charge but Tomic get lucky with a net cord assisted pass, apologizes but conceals his glee, much to Federer's dismay. Crucial point. Could've given Federer three breakpoints. Tomic holds to take a 4-3 lead. Tomic is showing some signs of fatigue, perhaps the long hours in the heat against Brands taking its toll? Federer may have sensed it and creates two break points. Tomic saves both with stellar play. Losing this set would certainly mean game over for Tomic, and he knows it. Multiple break points are saved. Tomic keeps finding the big serves. And when he takes an early mini break in the bester, thanks to a running, on the stretch, forehand down the line pass that Roger is unable to deal with, it seems that he is destined to make it a best of 3 affair. Roger keeps incredible focus down 3-5 to win what has been the defining rally of the match. Tomic cannot believe it, looks clearly rattled, is unable to win any more points, and loses the bester at 5. Federer is now up 2-0. Only two men have beaten him from that position, Tsonga, and Djokovic. And Tomic is light years away from being anywhere close to them. There is no way the Master is going to let this one slip by. The key to the second set has been Roger's ability to neutralize Tomic's heavy balls to his forehand, that have been a nuisance. Sort of an anticlimactic start to the third as Roger throws in a couple of charitable donations on his serve but is able to come out unscathed to take a 1-0 lead. The crowd seems to be in a lull as it realizes the daunting prospect their young challenger faces. It shows as Tomic finds himself in a 0-30 hole, saves two break points, which has become a ritual. Will this be just like the second set? Roger, the King of squandering breakpoints. Twice, Tomic gets a little too creative with drop shots and pays the price. Roger arrives at break point no 1304. Correction, 13. Tomic saves it with some heavy hitting and a clean forehand down the line. Finally, the moment arrives where Roger snatches the soul out of his young challenger. Break point number 14. Roger rushes to meet a dying, dipping, short ball, and sweetly whips a cross court forehand winner that may have been the proverbial final nail in the coffin. Roger goes through the motions to jump 3-0 ahead. What has Tomic got left? The firewall he has built has been breached. He tries to mix it up with a surprising serve and volley and Roger duly obliges with the most casual of backhand passes. and stays in touch at 3-1. Roger gets a routine hold and is now two service games away from a potential clash with the dangerous Canadian, Milos Raonic. The crowd is so sedated now, that the only thing anyone can hear is the sound of string beating the felt, and the squeaking of the sneakers. Jake Garner sounds tired and risks falling asleep. What a boring game this has become. Is this the only time ever that the Aussies aren't exactly enjoying a Roger win? Tomic seems resigned to his fate. He knows that his best so far has not been enough. It shows as he continues making errors, continues saving break points, but cracks eventually, to give Roger a 5-1 advantage. It's over! Roger holds and puts Tomic out of his misery. The King has shown the young Koala, that it takes more than just a hot head and trash talk to even be considered a worthy loser. “It's hard to explain. He is a bit better [compared to last year]”, says Roger. Where does Tomic go from here? He can learn a lot from this experience, as Roger said, or he can go back to what he seems to be doing best these days, driving his Ferrari and picking up traffic tickets. Overall, Roger didn't really learn much from this clash. Nor has it prepared him any better for the big serving Raonic. He couldn't have played any better than what he did today though. 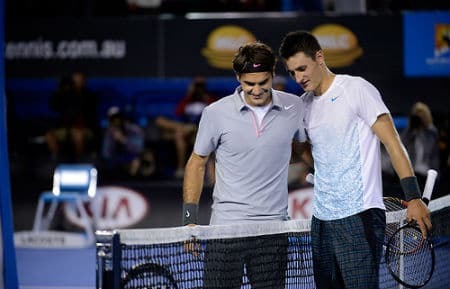 Compared to their last Grand Slam meeting, Tomic was injecting a lot more pace in his ground strokes, and tested Roger on the running forehand, time after time. It was played at a frenetic pace and Tomic couldn't even stretch Roger for a full two hours. The only worry would be the alarmingly low break point conversion rate, a product of Roger's high percentage approach of dealing with them, and Tomic's nerveless hitting in those moments. The only time Roger attempted a forceful top spin return on break point, he did so from uncharacteristically way behind the baseline, and failed miserably. Statistics at the net were phenomenal. Roger won virtually every time he was in the front court, 26 out of 30 to be precise. This would be very important in the next match. Dealing with the Raonic serve will be the biggest challenge, especially with the courts playing faster. If Raonic serves well, which usually is the case when he plays Roger, it could go four with a couple of really close ones. In keeping up with tradition, the prediction for this match: 6-4 5-7 7-6 7-5. On a really bad day, Roger may be stretched to five. Hope you enjoyed this, I've done my usual match report and thoughts on Roger's performance here and next up for him is Raonic. Could be an interesting one! Allez. Great write-up. And indeed, better than the BBC live updates 🙂 Was lucky enough to see the entire match, but now I could read it all over again including more than only the match report. Loved it! Thank you, Natasja! 🙂 Hopefully I’ll keep getting better as this. So glad Federer won last night. Tomic is much more presentable than the obnoxious Hewitt but he can still learn a lot if he studies BOTH Federer’s court craft and the way he conducts himself in interviews. Very true! I was never a fan of Hewitt’s style when he was in his prime, like you say very obnoxious, I found it difficult to even look at him. Maybe he has mellowed a bit these days. I heard he was quite good in the commentary box the other night though. Face for the radio I guess. Great read. The BP conversion could be a little worrying later on in the tournament, but honestly, he created 16 BP chances against what has been a very good Tomic serve, so that must count for something. As long as he keeps serving well he’ll be fine, because you know he’ll always get break chances and always break. 42 of 42 holds this tournament. Tomic was serving well on those break points. You’re right, getting to 16 breakpoints in 3 sets can be seen as a positive. Yeah his serve is key, if he takes care of his own service games then I think he will be fine. Tie breaks are always close so be nice if he can get a solitary break in each set and keep the advantage. Hi guys, I have a theory. Can you comment on this if I am correct or not. I did not watch the Davy match (had to work), but I did watch the extended highlights/summery on Eurosport. The Tomic match I have watched completely. I cannot believe that Roger had almost all breakpoints in both matches and did not convert a lot of them. Was he saving energy or treating it like a practisematch? For instance. Tomic match. First set, only the first game, then none. Second set he had almost bp all the time. (This goes also for the Davy match). Do you guys think that he did not want to give more energy to converting bp, because he knew that no matter what he would win and wanted to save energy for the other matches with the more dangerous players, or because he wanted to “practise” a lot more in the match? I don’t know if I am saying this the right way. If I could say it in Dutch I could explain myself better. But somehow I thought this is not Roger who cannot convert bp when he has like 12 or 16 of them, and he cannot convert even twice or more?? No, I cannot believe that. Somehow it felt like he did not give his best when it was the time to convert the bp. I think he is saving those moments for the likes of Tsonga/Andy/Novak. And I also felt especially during the Davy match that he could have finished the match much sooner, but it really looked like he stayed longer to “practise” some shots and see how far he could take them. Also today, the match with Tomic lasted 2 hours. Two hours?? Really?? This is not Novak or Andy we are talking about, but Tomic. He could have finished him off a lot sooner, but it really looked like he was treating it after the first set (or at least the second set) like a practisematch. He did not convert even one bp in the second set. Maybe it is just me, but Roger does not need to spend so much time on Davy and Tomic. In a way, you are right. These great players have a way of “fooling” around if you will, in early rounds. In case of Davy, Roger, as I had mentioned on a previous post, kept taking the shortest line to the baseline and missed. He also seemed a tad tight on those ones. You’re right. There is no way he was playing at his best, considering these were the second and third rounds. He may have intentionally prolonged certain points but there is no way he was trying to give Tomic a chance in the second. We also need to give Tomic credit for saving them. He kept finding his first delivery, and kept whacking at abandon on those key points (including a US Open 2011 Djokovic-style down the line). Hi Sid, you are right. It seems like I am saying that Tomic did not play well, but I don’t mean that. The second set was amazing. Even what Tomic did. I just found it strange that Roger could not convert more bp. With Rafa/Novak/Andy he has not got always a chance to convert, but today he had so many chances. But I have to be honest, Tomic was really very good at the second set. Roger will win the Raonic match, but not in straight sets (hopefully he does), but it will be in four maybe five sets. I am ready for him to win !!! Nah I disagree. No chance Roger is wasting break points on purpose or not treating them seriously. That’d be near suicide. Tomic served clutch on pretty much all break points. He could have been more agressive on some returns but I’m not sure what else he could have tried. 2 hours on court isn’t a long time either for a best of 5 set match. He got the job done as quick has he possibly could. The Tomic match could have easily gone 4 sets so no way he could have ended the match sooner I don’t think. “Factors that will keep Roger from winning AO”. 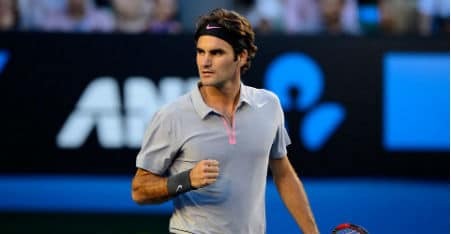 Really, again an article about why Roger will not win AO. And again not even one article that slightly hinds the fact that Andy or Novak could lose too. It is all about Roger losing. Today at the Tomic match and at “game, sets and mats” someting bothered me so much, I was so furious. The commentators on the match John Mac Enroe’s brother and another guy told that Tomic was playing the greatest tennisplayer of all time. In those exact words. Not arguabelly the best ever, or not considered by most, but both of them said a couple of times that Tomic was playing the greatest of all time and did he really think he could beat the greatest of all time, etc. Even Mats Wilander called him in his programm the greatest of all time. With those words. I loved to hear that, but what made me very angry was that when Roger loses his next match, they will start saying different things about him all over again. Saying that he is not the greatest of all time. It made me so mad, these are the same people that will take their words back the next time he loses. John Mac Enroe in my opinion has almost never said a kind word about Roger. If he does, he always takes it back after the next loss. John cannot hide his jealousy well. Even for someone like me (with no knowledge about tennis) it is so obvious that he is just plain jealous. The one person (in my opinion) who gives Roger always his due and what he deserves is Boris Becker. I really like him. He always praises Roger, but also says when he is not playing good. He says a lot of positive things and a few negative things about Roger. And I like that. You can see that he means it. One thing I have to say personally is that I did not like his grey/pink outfit that much. But now…… He is the only one who stands out (with his shoes). Almost everybody else is wearing yellow. Even in fashion he is way ahead of the others !!! I love it when these idiots, I mean, the commentators etc. rant about Roger’s chances. Of course, he is 31, he already has slam mileage and the younger players are more powerful. Do they have to say that again and again? They sure do, because they need to churn out these mundane articles. Just ignore them. John Mac is bitter because Roger has always snubbed him. He has been trying to give him unwarranted advice for quite some time. I even heard he wanted to coach Roger. He isn’t amused that Roger has pretty much ignored him and now he will do anything to bring down the Great one. This is John McEnroe for crying out loud. When he takes the court, or the microphone, stupidity wins in straight sets. I really hated the pink attire. I still do. But I must admit, though I’m a guy, that Roger looked hot with that bandana 🙂 He looks, royal, for lack of a better word. Hi Sid, in my opinion guys should not wear pink (don’t attack me !! ), but Roger pulls it off !! Katyani, yup, guys should not wear pink. In the United States (not sure where you are from), pink signifies a certain demographic. Not that there’s anything wrong, but pink sure isn’t for guys. If Roger wins the AO, we can all forgive him for that color choice. John McEnroe is a bandwagon kinda guy. Gets behind whoever is winning at any given time! The commentators/critics/reporters/journalists/Novak and Rafa fans and voters who say that the AO 2012 final was the best match of 2012 really should have looked at the Monfils/Siomn match of today !!! Wow. Wow. Wow. I was not finished yet, but somehow (without touching post comment) my comment is placed !!! I don’t know why this happens or how. Monfils and Simon were incredible. They don’t give up. They were breathless, seeking for more breath, having injuries with there legs, knees, lowerarms, lowerback and I don’t know what else, but neither of them wanted to lose. They really gave it their all. After the first and second set Monfils was halfdead. I thought he would lose. He somehow fought back and like a miracle won the third and fourth set. At the fourth set Simon was halfdead. I thought Monfils would win. But the fifth set was incredible. It was so exiting and amazing. Respect for both of them. I had never seen Simon play and Monfils I thought he was funny, but I have gained so much respect for them. Long and long rallies (one was 71 strokes !!). I thought both of them would retire with injuries, but this match shows that no matter if you are not one of the big four, NOBODY wants to lose. At some point even I thought why are you guys doing this to yourself and your body? Just let it go and play your best at the next tour. Really, tennisplayers, even if they are injured, breathless or down, they never walk away from a GS. For me Novak’s and Rafa’s match last year was nothing compared to this match. I always liked Gael, but I did not think he could play this well. Was really rooting for him. Simon will now play Andy, but I don’t thinkhe can win (to tired/injured). Clownfils vs. Simon was terrible for tennis I thought. 2 pushers going at it. It was anti-tennis! This has happened to me now for the third time, I write a comment, push on the button post comment and I get “error, you have already posted this comment or something like you have already written this comment”. Sorry Sid, I am posting like Jonathan wrote this article, but you have. Nice article !! An excellent post! Are you a pro writer by any chance? Although I watched the match live on Eurosport, I reviewed and enjoyed the full highlights with some points of interest according to your report after reading it. So thanks! Glad to hear that Roger created many chances was a positive sign rather than worrying his BP conversion. He will tidy that department up against Roanic for sure! Thanks, Wanda! 🙂 No, I’m far from professional. Also, Jonathan added all the embellishments, the formatting, spacing out, titles, pictures, and video, so he has put quite some effort into making it look presentable and professional. I’ll try to do some more “like live” articles like this one. Especially, if Roger can win it all. I saw the whole match of Novak/Stan and wow, wow, wow. What a match. Novak won, but Stan DESERVED to win. He played so so good. It was so exiting. I felt to bad for him at the end. When he was two sets to one down, he could have thought that he lost anyways and just plays. But he kept fighting. 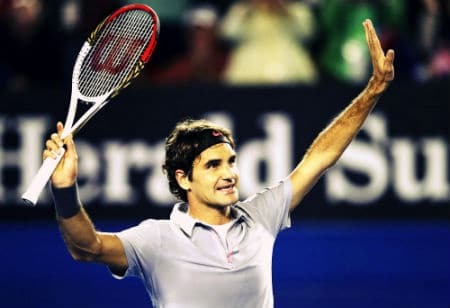 I was so happy when he won the fourth set. Novak played well too, I have to say that, but Stan really deserved to win. He deserves so much more than to be called Swiss number two. The way he played, he deserves to be in the top 5. This was not just a fluke. He really played well. I have always been his fan, but I was a little disappointed when he spoke in the press about Roger not doing the Davis cup. It was not bad of him to say that, but he should not have said it to the press. Now however, I have gained so much more respect for him with the way he played today. If he would have won, it would also sent a message to the tennisplayers that you can win from the top 4. Everybody (incuding ME) have said that Novak has an easy draw. And that is still true. But there is always a Rosol/Wawrinka who play the match of their life and challenge you. One last thing I have learned today….. Novak can be beaten on his backyard (AO), just like Rafa can be beaten on his backyard (RG) and Roger can be beaten on his backyard (Wimby).